Your body is the most sophisticated thing in the Universe, and you should view it as your most treasured possession. But you did not arrive in this world with a user’s manual that tells you how your body works, particularly in relation to the food you put into it, and what goes wrong when you do things differently to how you have evolved. Two thirds of western society are either overweight or suffering from obesity. This is a potent source of unhappiness, extending in many to anxiety, stress and clinical depression. But there’s also a significantly increased risk of serious diseases such as cancer, heart attacks, strokes, Alzheimer’s disease, arthritis and diabetes. If you contract any of these there’s a very good chance you will die prematurely. Statistics show that what we are currently doing is clearly not working. And that’s because people simply don’t know or have been given the wrong information. 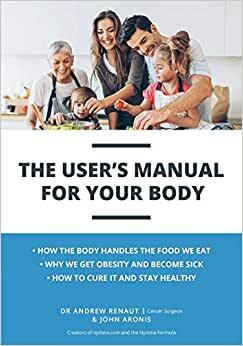 The User’s Manual For Your Body provides in simple terms everything you need to know. Start reading The User's Manual For Your Body on your Kindle in under a minute. Dr Andrew Renaut MS(Lond) FRCS(Gen) FRACS FDSRCS Cancer Surgeon Andrew is an Englishman who moved to Brisbane twenty years ago where he now lives with his two daughters Alyssa and Sophie, and where he runs a busy surgical practice looking after patients with cancer and other bowel-related conditions. He has spent forty years studying and operating on the human body and has a profound understanding of how it works particularly in relation to the food we put into it and what goes wrong when we feed it differently to how it has evolved. He is passionate about wellbeing and prevention and it's a constant source of disappointment seeing so many patients suffering serious disease and dying early because they haven't been given the right advice. With The User's Manual For Your Body he hopes to turn this around. He also has a master's degree in surgery for which he wrote a thesis based on some of the immune mechanisms in cancer. With this knowledge he has proposed the Renaut Hypothesis - he believes it is a defective immune system that causes many of the health problems, such as cancer, heart attacks, strokes and Alzheimer's, that are associated with obesity. When he's not doctoring, Andrew sails fast yachts, flies fast planes and drives fast cars. He also skis down mountains fast and is an accomplished chef; he likes doing all of these things in the company of his two daughters. He maintains peak physical and mental fitness by using the Nysteia Formula every day.